I was able to sample these gooey and chewy Gavino’s Japanese donuts when I attend last year’s Blogapalooza and I must say I really fell in love with its delicious taste. It is not your usual donut and it also comes in a bevy of exciting and new flavor, like sourcream, for example. 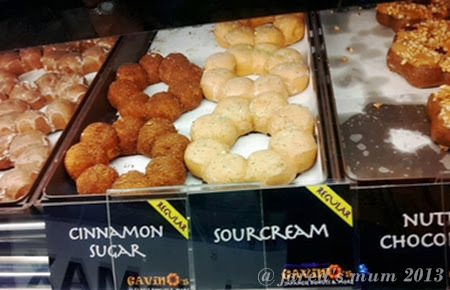 Unfortunately, I was not able to come across a Gavino’s Donuts branch and I was not able to try the other variants and flavors they have available. I would’ve really loved to sample their Mochi donut varieties. Note: This post is not, in anyway, sponsored by Gavino’s Donuts. This entry was posted in food musings and tagged donuts on 19.March.2014 by admin.